There is a tale claiming that Santorini was born from fire. And it’s true! The island you see today is an outcome of massive explosions that happened approximately in 1600 BC. What you might not know, is that this was the second largest eruption in human history! The biggest happened in Indonesia in 1815. 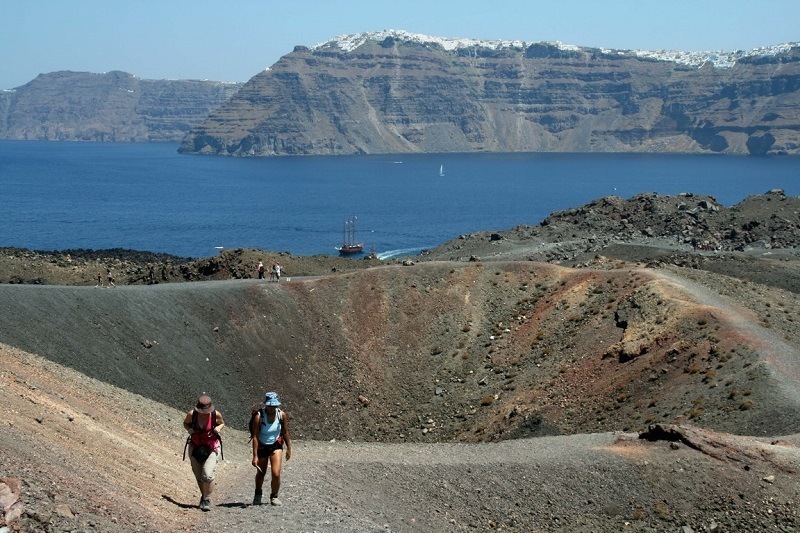 Santorini started to appear above the sea about 1.2 mln years ago. Until it gets its round shape, before the big explosion, earthquakes and small explosions from 3 different volcanoes occurred. This volcanoes where the Volcano of Akrotiri, Volcano of Peristeria and Volcano of Skaros. About 30000 years ago, the island finally aquired its round shape, while having twice the size of today’s Santorini. At this point, the island was called Strongili (circular). Then, about 25000 years ago, a quite violent explosion of Riva Volcano, sank the central part of Santorini and the first caldera was born. It looked more like a ship port, as it was surrounded by the island with only small water “entrance”. About 3700 years ago, Santorini had its final shape before the big explosion. The island population before the catastrophic event was about 30000. Today, the permanent residents are just above 18000. During the explosion in 1600 BC, about 60 cubic kilometers of volcanic ash was released to the atmosphere, reducing Earth average temperature by 4 degrees Centigrade for 2 years. 30 m high waves flooded the coast of the Cyclades. The evidence of the eruption are found all over the north hemisphere, proving the global impact of the event. The aftermath for Santorini was devastation. 25% of the island sank, 60 m thick layer of ash fell on the island, lengthening its east coast by 2 km. Because the scientists believe that the eruption destroyed the Minoan Civilisation, it was called Minoan Eruption. The volcano you can see today, emerge during the past 2000 years. The last 150 years Nea Kameni has tripled in size. In 1950 was the last small eruption of the volcano. Today the detailed observation of the volcano makes it more safe than ever before.